An enquiry into the immediate causes of the Eureka Stockade known as the Gold Fields’ Commission of Enquiry held its first meeting on 07 December 1854 in Melbourne. 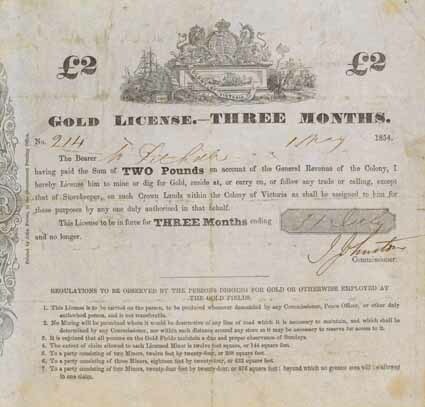 Gold License, 01 May 1854, University of Ballarat Historical Collection. Report of the Gold Fields Commission, in Votes and Proceedings, Legislative Council, 1854-5, 11, A 76. Governor Hotham decided to appoint a royal commission to report generally on the gold fields on 16 November 1854 - before Eureka. The Letters Patent, however, were dated 7 December, 1854, four days after the Stockade. The Commission met first in Melbourne on 14 December, and then in Bath's Hotel, Ballarat, on 18 December. Its Report is dated 27 March, 1855. The record of evidence runs to 361 foolscap pages, recording 6381 questions and answers, all verbatim. The members of the Commission were:- William Westgarth (Chairman), John Hodgson,John Pascoe Fawkner, John O'Shanassy, William Henry Wright, and James Ford Strachan. 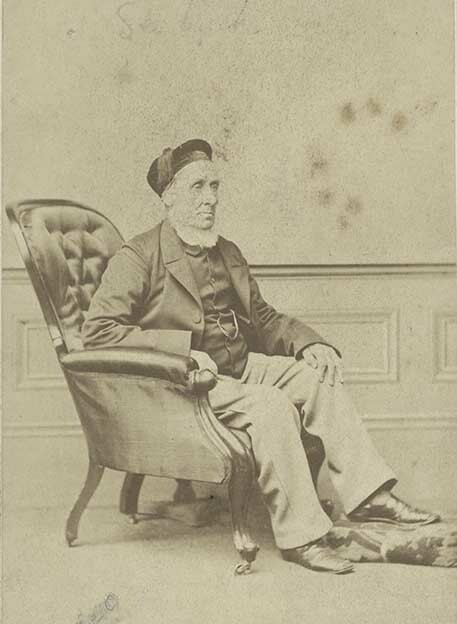 Wright was Chief Commissioner of Gold Fields. All the others (except Westgarth) were members of the Legislative Council. The Royal Commission was known as 'the Gold Fields Commission', not to be confused with 'the Gold Commission' which had the management of the gold fields prior to the 1855 Act. ↑ Dr R. L. Sharwood, The Local Courts on Victoria's Gold Fields, 1855 to 1857, Melbourne University Law Review, Vol. 15, June 1986. ↑ Dr R. L. Sharwood, The Local Courts on Victoria's Gold Fields, 1855 to 1857, Melbourne University Law Review, Vol. 15, June 1986, Footnote 11.